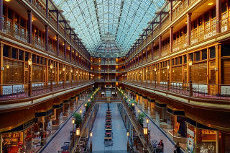 The United States is known for having some of the world’s largest shopping centers with huge selections to choose from, attracting visitors from all over the country and abroad. These outlets cater to a variety of shoppers and even offer convenient bus services to and from major cities, allowing customers to save money on gasoline which can be better used for a shopping spree and not worry about the hassle of finding a parking space. Here are some of the largest outlets in the US and how to get there. Fortunately, many of America’s top outlets are not only accessible from major cities, but are also in towns that offer plenty to do once you’ve purchased everything on your list. From amusement parks to ski resorts and local museums, it’s easy to plan a day trip for the whole family or give some of your relatives who aren’t so enthusiastic about shopping an alternative way to spend their day. Less than two hours away from New York City, the Woodbury Commons is one of the world’s largest outlet centers with over 200 stores, covering approximately 800,000 square feet. With efficient transportation between the city and the outlets provided, the center attracts many visitors to New York City as well as natives and shoppers can expect an array of languages to be spoken, including Spanish, Japanese, Chinese and French. The complex is even color coded so that shoppers can easily find what they’re looking for. Nearby attractions include the West Point Museum, the Storm King Art Center, Bear Mountain State Park, and America’s oldest winery, Brotherhood. The largest shopping mall in the United States opened in Minneapolis in 1992. Today the Mall of America not only offers a massive variety of shops to peruse, but numerous attractions as well, making it the perfect destination for a day out. The Nickelodeon Universe is the country’s largest indoor theme park, with roller coasters and all, and the Sea Life Minnesota Aquarium features a 300-foot-long tunnel for people to walk through and spot thousands of sea creatures, from sharks to turtles. Nestled in the scenic Berkshire mountains of Massachusetts, the Lee Outlets provide a quality shopping experience with a quaint New England charm. With over 60 stores, visitors will have several options. The region is also well worth a visit with top ranking theatres, the Norman Rockwell Museum, the Clark Art institute and Tanglewood, which is the summer home of the Boston Symphony Orchestra. After a long shopping spree, what better way to end the day than to stop by one of the area’s spas or resorts for some relaxation before heading home? Those looking for some outdoor adventures can go hiking on one of the nearby trails or visit one of the area’s ski resorts.